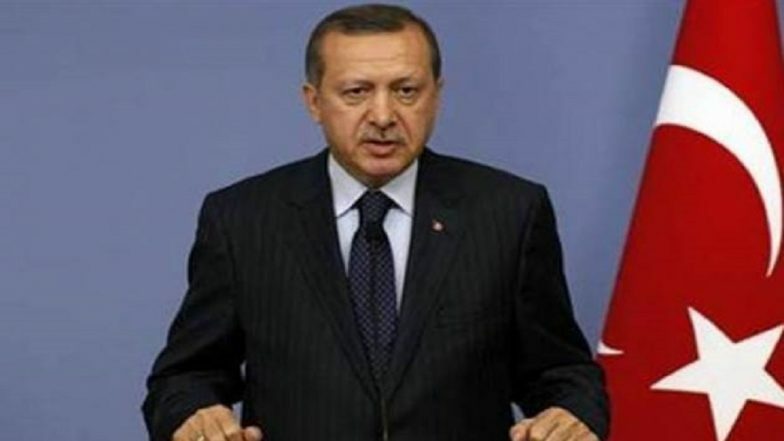 Ankara, April 1: Turkish President Recep Tayyip Erdogan's ruling Justice and Development party (AKP) lost control of the capital in local polls, which is being seen as a setback to his 16 years in power, the state media reported. Preliminary results of the Sunday local polls showed the opposition narrowly ahead of the President's AKP in Istanbul, the country's largest city, the BBC reported. According to the state media, the AKP also lost Turkey's third city, the historically secular coastal city of Izmir. There, the opposition People's Republican Party (CHP) was leading with more than half the vote, while the AKP was at least 20 points behind. The results, if confirmed, will be a blow to Erdogan who has dominated Turkish politics since becoming Prime Minister in 2003. Nationally, the AKP-led alliance won more than 51 per cent of votes in the municipal elections. In Ankara, the CHP won more than 50 per cent of votes while the AKP trailed on around 47 per cent, state news agency Anadolu reported. It is the first time in 25 years that the Islamist party has lost its grip on the capital. The AKP's loss in Ankara sent shockwaves throughout the country and the party alleged "invalid votes and irregularities in most of the 12,158 polling stations" in Ankara. "We will use our legal rights to the fullest and will not allow the will of our citizens to be altered in Ankara," the party's General Secretary Fatih Sahin tweeted. In Istanbul, the result was too close to call on Monday. According to Anadolu, the CHP received 48.79 per cent of votes, narrowly ahead of the AKP with 48.51 per cent. Turkey's Supreme Election Council said the votes from 84 ballot boxes were yet to be included in the final count as there were objections. Both parties claimed victory in Istanbul, Anadolu reported. The AKP said it would challenge the result in Istanbul and Igdir. The elections were widely seen as a referendum on Erdogan and his party. In a speech on Sunday, Erdogan said lessons would be learned. "People who come up with false promises, go ahead. We will see how they will rule, we will continue on our path -- by taking lessons from our mistakes in this election," he said. The President previously said the poll was about the "survival" of the country and his party. He, however, vowed to focus his leadership on the Turkish economy ahead of national elections in 2023. CHP leader Kemal Kilicdaroglu said: "The people have voted in favour of democracy. They have chosen democracy."